Published 4/15/2011 . Last updated 3/29/2019 . The egg hunt is done and the Sunday dresses have been traded for play clothes. You’re frantically looking for the next activity that will entertain your kids and all of their cousins before they decide to play another game of “Let’s empty the entire closet onto the floor.” You suddenly remember this post and heave a sigh of relief. You click on this download link to print out a bunny coloring sheet for each child (the same as the bunny above, minus the color). While the kids are coloring, you entice other adults to hang out with you while you prepare the bunny tails. As each child finishes coloring his/her bunny, you present them with a tail, take a photo for posterity (if that’s your thing), eat the tails, and optionally start over. Warning: You might want to have a special prize for the best coloring job. 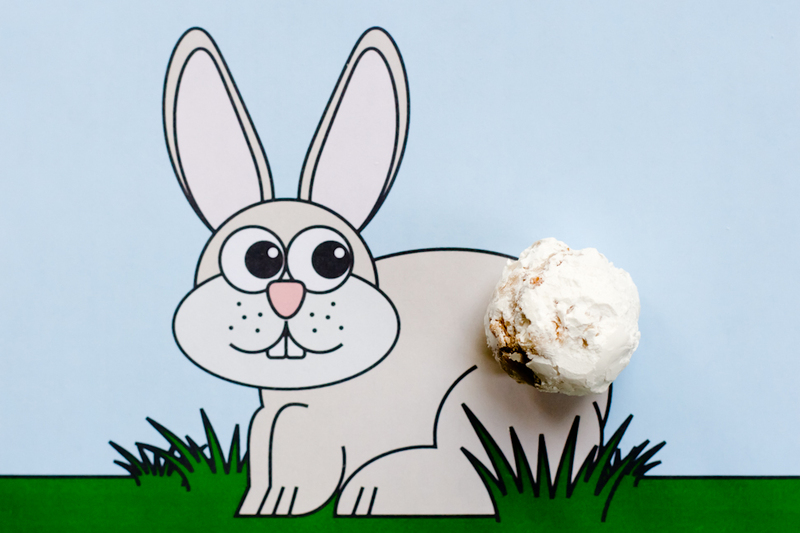 Otherwise, you’ll find that the bunnies will be hop-hazardly colored as every-bunny hurries to be the first to enjoy their treat. To stretch out the fun – head over to my Facebook page and upload your pictures. I’d love to see them! For my bunny tails, I used homemade lemon and sour cream donut holes. I got the recipe from the fabulous Tartelette. If you’ve never had homemade donuts, you are in for a treat. While I admit to eating these donuts days after frying them, I don’t recommend that course of action. The experience of a fresh, hot donut is a culinary delight that is hard to top; and a cold, day-old donut is like a washed up superstar who is now known only for their appearances on reality TV. The lemon flavor of this particular recipe sings of Spring (I can imagine Snow White eating these with happy little birds flitting around her). For those who like airy donuts, I must mention that these are more dense/cakey donuts – similar to beignets. The lemon flavor of this particular recipe sings of Spring and these are very dense, cakey donuts. In a medium-sized bowl, whisk together the flours, baking powder and salt. Set aside. In a separate medium-sized bowl, whisk together the sugar, sour cream, eggs, zest and lemon juice, and the olive oil, until smooth. Add the reserved flour mixture, and stir with a spatula until the mixture is smooth. For the cast iron method, heat the oil over medium heat in a large heavy bottomed cast iron pan or Dutch oven until it reaches 325 F. Scoop the batter using either 1/4 cup full (you will get less donuts) or a two-tablespoon ice cream/cookie scoop and fry 4-5 at a time without overcrowding your pan (turns the oil temperature down which makes your donuts greasy). Fry each batch for 4-6 minutes, occasionally monitoring the temperature of the oil. For the fryer method, prepare your fryer per the operating instructions. Heat oil to 325 F. Scoop the batter into the fryer a couple of tablespoons at a time and fry each batch for 4-6 minutes. I like using a fryer because I find it to be neater and safer (I worry less about getting splattered with hot oil). At first, I had a problem with the donut batter sticking to the fry cage, but I found that if the cage was submerged in the oil when I dropped the batter in, I did not have that problem. I also found that the slower I dropped the batter in the oil, the more likely it was to keep its round shape. Roll the hot donuts in powdered sugar and serve hot. This sure looks delicious and festive. I bet you had a great Easter. My kids would have loved a present like this. I don’t recommend that course of action!